Adaptations of Key’s visual novels have become some of my favorite anime series of all time, as the way that they’re able to merge memorable characters and tear jerking drama/tragedy with a supernatural/fantasy flair has made their stories stick with me. Their latest work to get adapted was Little Busters!, but for the first time it was handled by a studio other than Kyoto Animation. J.C. Staff definitely did a great job of bringing the visual novel to life with the first season, but the characters and scenarios didn’t make as strong of an impression on me when compared to Kanon and Clannad. But as I learned with Clannad, any Key series that gets a second season will be where the story truly kicks in and makes its mark. That’s exactly what Little Busters! Refrain has to offer, as the 13 episode follow-up season covers the final scenario in the visual novel and further explores the relationship between the main cast while continuing to provide some truly sad moments. Like other Key adaptations, the first season of Little Busters! introduced viewers to a wide range of characters and explored the arcs of quite a few of the female leads. We became familiar with Riki Naoe, a high school boy who lost his parents when he was young and has narcolepsy that kicks in at the most inconvenient times. Riki’s group of childhood friends named themselves the Little Busters, which leader Kyousuke revives as a baseball team early on. The first season followed what I would consider to be the standard Key format, as each of the heroines is introduced and then they go through something extremely difficult that Riki must help them to solve. While Clannad was focused on the romantic and family life angle, the overall theme that I took from Little Busters! was how strong the bonds between friends can be and how that can be used to overcome the struggles in life. It doesn’t really make sense to recap all of the arcs from the first 26 episodes, as hopefully you will have already seen them if you’re reading this review. The first season definitely had some standout moments and did an even better job of mixing lighthearted and downright hilarious sections with the usual drama, but I didn’t find myself connecting with Riki and the rest of the main cast quite as much as I had hoped. The scenarios were interesting and there were the beginnings of a good group dynamic between the fairly large number of characters, but it didn’t quite reach the same level of Clannad or Kanon. My main issue was that at this point in the series, Riki wasn’t exactly the most exciting lead as he fit the stereotypical “weak high school boy surrounded by much stronger individuals” mold that I’ve seen so many times before. My hope was that in Refrain he would come into his own. At this point it was also clear that Rin, Kyousuke’s sister, would be the main heroine as there were numerous points throughout the main series where Riki and Rin would embark on tasks after being given a mysterious note telling them there was a secret to the world. I prepared myself for what would inevitably be an extremely sad viewing, as I learned from Clannad After Story that when it comes to second seasons of Key series the mix of lighthearted silliness and drama gives way to all drama. However, even though I knew what I was getting myself into Refrain still managed to hit me harder than I was expecting. Little Busters! Refrain begins on a happier note, as the friends are all celebrating the success of their first real baseball game, even though they didn’t end up winning. If you were hoping for more moe from characters like Komari and Kud this is your best chance as the condensed number of episodes leaves a lot less opportunities for sillier moments. The first major arc is focused on Kurugaya, who we learned a little about in the first season. She’s extremely smart but has an icier exterior that made her come off as arrogant at times, but the Little Busters helped her to mellow out a bit and make friends for the first time. Early on in Refrain a group of girls tries to prank Kud and Komari to get back at Kurugaya, who responds by confronting them along with Riki and kicking a door down with one kick. It’s clear that there’s a lot more to her character beneath the surface, but what occurs after this is a little different than what I was expecting. The previous heroine arcs went through the usual format: viewers learn about a particular girl and a bit of her background, and then find out about a terrible tragedy they’ve been through. Riki then helps the girl overcome this obstacle and they become a tighter knit group of friends. But with Kurugaya’s arc, there’s not a real sense of resolution. Although viewers are given a window into why she became fairly withdrawn and acted in a way that discouraged friendship, Key’s use of fantasy/supernatural elements begin to ramp up during her arc. Riki begins to notice that the same day is repeating itself over and over again, but none of his friends seem to be affected by it and each time things are just slightly different. At this point I began to question exactly what was real, as it seemed as though everything that was occurring could just be a dream brought on by Riki’s narcolepsy. After Kurugaya’s arc comes to a conclusion, she’s mysteriously vanished from the group and isn’t seen again for quite some time. At this point the real storyline of the season begins, as the focus shifts back to Riki and Rin, and the two begin to date (though neither of them seems fully sure of exactly what that means). Previously they had been given tasks to reveal the “secret of the world,” which seemed like a thinly veiled excuse to get them to grow as individuals and become stronger. The two are given a final task to show the Prefectural Assembly around the school, which leads to Rin agreeing to transfer to another school that had experienced a tragic bus accident. Each time she is shown returning to see Riki her condition becomes worse, and eventually the two end up running away planning to escape the hardships. Another bout of narcolepsy strikes Riki shortly after the two run away, and this is where Little Busters! Refrain takes another turn towards the fantasy angle. When he awakes, the events go back to the very first episode of the series, only Kyousuke is no longer the leader and has locked himself in his room in a deep depression. What follows is a re-telling of how the core members of the Little Busters came together, only with Riki now in the lead role. Revealing too much else about what happens from this point on would give away the major twist about the ending, but for the remaining episodes the series blends elements of fantasy and some of the saddest, tear jerking scenes I’ve seen in a while. It reaches the point where whenever a certain song starts to play in the background I almost started crying because I knew something was about to happen. The number of episodes may have been cut in half for Refrain, but I found that it packed more depth this time which made me better able to connect with the main cast. 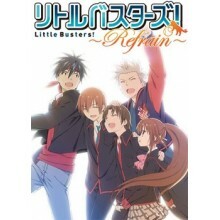 Although much of the lighthearted elements disappeared after the first episode or so, there was more time dedicated to the original Little Busters group (Kyousuke, Kengo, Masato, Riki, and Rin). Kengo and Masato had spent the majority of the episodes as comic relief characters with an occasional serious moment added in, but this time around a lot more was explained around them and they were given a considerable amount more depth than I was expecting. What I also really liked was that it explained how this core cast came together and became friends and did a good job of exploring how people can come together and form long lasting emotional bonds. J.C. Staff is a studio that I’ve followed for a number of years, and they’ve produced some of my all-time favorites (Toradora!, Shigofumi). The style they utilized for Little Busters! and Little Busters! Refrain definitely fits with how Key animated the game, but the studio does seem to have put its own spin on it. As the majority of the series takes place at a school there were plenty of re-used locations, allowing the animators to pay greater attention to the characters. Each member of the cast has defining traits that make them easy to pick out, and there were plenty of exaggerated facial expressions to enhance both the silly and emotional moments. I didn’t notice any major drops in animation quality throughout the 13 episodes, and as a whole I liked how J.C. Staff was able to capture the series and provide a hint of fantasy and the supernatural without overdoing the effects. I’ve already mentioned the music briefly, but once the somber emotional moments began to dominate the episodes the background music perfectly accentuated the mood and made them that much more powerful. Admittedly J.C. Staff has reused quite a few of the songs from the previous season, but considering how well they worked before this isn’t that big of a deal. Voice acting continues to be an area that I think will be fairly hit or miss with viewers, as the sickly sweet voices of many of the female characters may be too much for some to handle. The main cast shines once again, and they really sell the emotional bond between the group of friends and makes them feel like they’re real people. It’s also worth mentioning that the opening song “Boys be Smile” is not only catchy, but it has a more subdued sound than the opener from the first season which signals the shift in tone between the two series. Little Busters! may not have grabbed me as much as Key’s previous work during its first season, but during Refrain everything started to really sink in. Prepare yourself for some serious emotion though, as every single one of its thirteen episodes has moments that will likely make you tear up. While there are elements present in both Little Busters! and Little Busters! Refrain that will be familiar to anyone that has watched any of the previous Key adaptations, the way that this one examines the themes of overcoming tragedy and hardship through the powerful bonds of friendship makes this series capable of standing out.